OMINOUS dark clouds gather overhead and the light breeze has a biting chill to it as it whistles through the trees. But despite the gloomy weather, when radiant bride Leleti ?Khumalo walks down the aisle towards her eagerly awaiting groom it’s as if the sun is shining in all its glory. She beams and waves at her guests as she makes her way slowly to the man in question, Skhuthazo Winston Khanyile (SK). As she glides towards him, their eyes lock and it’s as if the love they share for each other radiates from them. 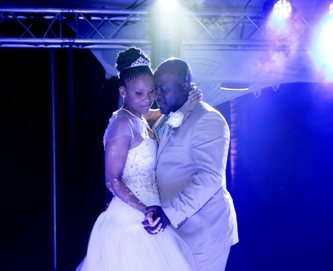 Set in lush green gardens on the South Coast of KwaZulu-Natal, the venue is perfect for a celebrity wedding. Tall trees and flowers in full bloom surround the area where the wedding service is taking place against the backdrop of the stately, baronial Lynton Hall which has played host to the rich and famous for more than 100 years. In contrast to the majestic proportions of the imposing venue, the altar is simple but elegant. It consists of a specially made gazebo draped with white cloth and ?adorned with bunches of white roses and carnations. Guests, seated on pristine white chairs, lean forward eagerly in ?anticipation of the wedding ceremony and the magic of what’s taking place at the altar. Leleti is the picture of a fairy tale ?princess.